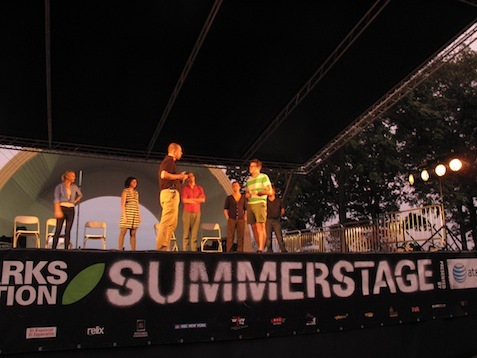 The Upright Citizens Brigade theater, nationally renowned as one of the absolute best resources for improv and sketch comedy in the country, presented a couple of its best troupes last night in New York City’s East River Park, as part of the annual SummerStage festival. 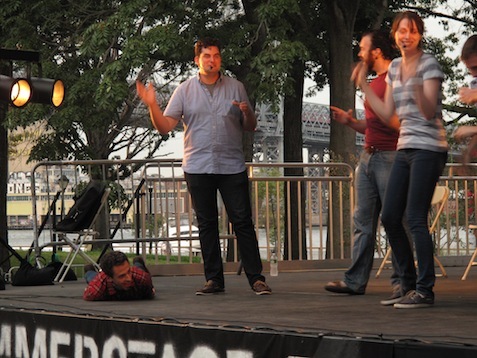 Showcasing two distinctly different collectives with a brief intermission, the show was a great example of how good improvisational theater can be when carried out by skilled performers adept at thinking on their feet. It was a unique treat to be in attendance, especially since this particular show will, by definition, never be seen again. 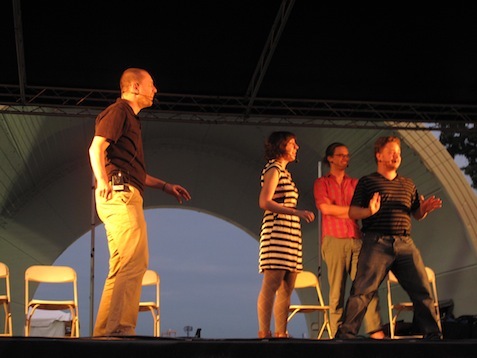 The first troupe, known as The Pox, followed the format of UCB’s celebrated “ASSSSCAT!” show, featuring a monologist telling a personal anecdote based on an audience suggestion, followed by a series of improvisational sketches based on that monologue. Their skits revolved heavily around the experience of out-of-towners visiting New York, such as a scene in which a tourist is robbed at gunpoint in Central Park, then decides that video of the robbery would be a great souvenir of his visit and begins directing the robber while his friends film it. Another highlight was a sketch in which a teacher ruins the joy of swearing for her twelve-year-old students by telling them that Shakespeare coined many of the English language’s best curse words. One of their best ideas, however, was the last scene of the first set, in which a man gives god credit for everything from work promotions to his wife’s pregnancy (“No, I think I knocked god up … or god knocked himself up”), then likewise shifts the blame for a car accident in which he is at fault onto the almighty. It’s truly amazing how well Sandino incorporated elements of all their sketches into one large narrative, to the point that the final revelation that prisoner P90X is actually Virgin Group mogul Richard Branson (who designed the boredom robot in order to gain perspective on his overly exciting life) made perfect sense. This is a tremendously talented group of performers, and while I feel privileged to have attended their only performance of this specific material, I certainly hope a video recording is made available in the near future. Forty-three years after their original 1969 formation, the legendary band War can still rock a stage with the best of them and provide a funky good time for audiences of all ages. 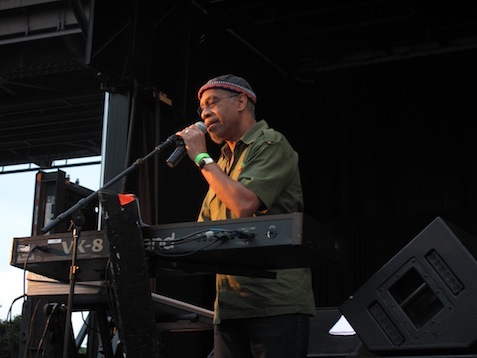 Of course, the only original member still in the lineup is keyboardist and current lead singer Leroy “Lonnie” Jordan, but since the band has cycled through more than 25 members since its original inception, this is no surprise. 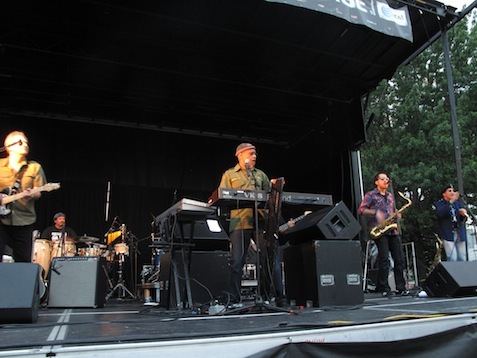 The band, in its current seven-piece configuration, played a free show at Queensbridge Park in Queens, New York, last night as part of City Parks Foundation’s annual SummerStage series. 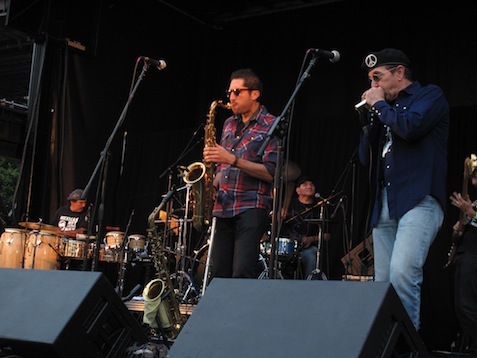 Probably about 400 people, ranging in age from toddlers to elderly folks, were in attendance, and War played an excellent two-hour set full of positive energy and musical prowess. After an hour-long warm-up from DJ Felix Hernandez’ Rhythm Revue, War opened their set with the funky, upbeat “Me and Baby Brother,” from their 1973 gold record “Deliver the Word,” and the already dancing crowd really began to get down. Jordan is an exceptionally charismatic frontman who really commands the stage even when boxed in behind his keyboards, but he stepped out early on in the show to lead an audience sing-along to the 1972 hit “The Cisco Kid.” He joked that if anyone in the crowd could tell him how many other War songs contained the word “wine,” he would let that lucky fan buy him a glass of wine. Jordan then slowed the upbeat set down a bit with the more serious jam “The World Is a Ghetto,” from the 1972 album of the same name, taking time to speak off-the-cuff about changing the world for the kids in the audience. He referred specifically to an adorable toddler dancing near the stage, of whom he couldn’t quite identify the gender, saying, “They don’t know when they’re that age anyway. Let ’em worry about all that when they get older.” The band also catered to an unexpected fan request by playing the gorgeous, tempo-shifting instrumental “City, Country, City,” also from the “World Is a Ghetto” album, which really gave saxophonist Fernando Harkless and harmonica player Stanley Behrens a chance to shine. Though the overall set was mostly very up-tempo and danceable, War took time for a couple of slow love ballads near the end. Jordan took a lengthy vocal and keyboard solo for the beginning of the beautiful 1973 title track “Deliver the Word” before letting the rest of the band join him to jam it out, and drummer Salvador Rodriguez sang a love ballad of his own before War broke out their two biggest hits. On “Why Can’t We Be Friends,” from the 1975 album of the same name, each of the seven members of the band sang one two-bar verse, except for percussionist Marcos Reyes, who relegated the last small verse to an audience sing-along. They closed with the iconic hit “Low Rider,” from the same album, and of course the crowd loved it, many of them begging for one more song. Unfortunately, the free outdoor show had a strict ending time, but it is a testament to War’s energy, vitality and long list of beloved hits, that a two-hour set could still leave us wanting more.